The author of the best-selling and universally adored No. 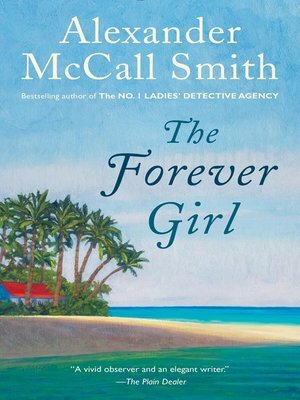 1 Ladies' Detective Agency series now gives us The Forever Girl, a novel about love and following one's heart, and the unexpected places to which this can lead us. Amanda and her husband, David, feel fortunate to be raising their son and daughter in the close-knit community of ex-pats on Grand Cayman Island, an idyllic place for children to grow up. Their firstborn, Sally, has always listened to her heart, deciding at age four that she would rather be called Clover and then, a few years later, falling in love with her best friend, James. But the comforting embrace of island life can become claustrophobic for adults, especially when they are faced with difficult situations. At the same time that Clover falls in love with James, Amanda realizes that she has fallen out of love with David . . . and that she is interested in someone else. While Amanda tries to navigate the new path her heart is leading her down, Clover finds, much to her dismay, that James seems to be growing away from her. And when they leave the island for boarding school--James to England and Clover to Scotland--she feels she may have lost him for good. As Clover moves on to university, seldom seeing James but always carrying him in her heart, she finds herself torn between a desire to go forward with her life and the old feelings that she just can't shed. Through the lives of Clover and James, and Amanda and David, acclaimed storyteller Alexander McCall Smith tells a tale full of love and heartbreak, humor and melancholy, that beautifully demonstrates the myriad ways in which love shapes our lives.